In recent years, there’s been an increased interest in pain neuroscience education (PNE) due to growing evidence for the efficacy of PNE to decrease pain, disability, fear-avoidance, and pain catastrophization. PNE teaches people in pain about the biology and physiology of their pain experience including processes such as central sensitization, peripheral sensitization, allodynia, and neuroplasticity. PNE’s neurobiological model often finds itself at odds with traditional biomedical models used in manual therapy. Traditional biomedical models focusing on anatomy, pathoanatomy, and biomechanics have been shown to have limited efficacy in helping people understand their pain, especially chronic pain, and may even increase a person’s pain experience by promoting fear-avoidance and pain catastrophization. This contrast between PNE and manual therapy has seemingly polarized followers from each approach with one group viewing PNE as a ‘hands-off’ approach and the other as “hands-on” with no PNE. I think this is a grave mistake and in this blog I’ll explore the notion of PNE and manual therapy co-existing by looking at the positive effects of touch therapy on the hormonal system and the accompanying “innate” communication that begins between mother and child. The earliest way we begin to learn what our bodies are and where the outside world begins is through the tactile sense of touch, beginning with touch between momma and baby. Manual therapists are blessed to be able to help people through touch and for the most part, all forms of caring touch are good. Yet, according to new research by Boehme, et al, some forms of touch may have a more powerful impact than others.1Their study suggests thatbecause the brain attempts to predict the sensory consequences of every action, it attaches less importance to self-touch (initiated by our own hands), since this stimuli is expected. Bottom line: The brain pays more attention to touch by others (novel stimuli) since it is unable to “predict” the outcome. Taking these findings a step further, we could say that novel touch during a therapy session with the client actively engagedshould further enhance sensory input leading to increased nervous system stimulation and greater therapeutic impact. So how do we do this? Homeostasis refers to the body’s ability to maintain a stable internal environment via regulating hormones, body temperature, acidity-alkalinity (pH), blood pressure and levels of certain nutrients with a goal of keeping our tissues perfused with oxygen and our cells well fed. To maintain this steady state, our body secretes hormones such as adrenalin. Indeed, when we encounter an acute perceived threat – a large, menacing dog, for example, the hypothalamus sets off an alarm system in our body, sending chemical signals to the pituitary gland. The pituitary, in turn, releases ACTH (adrenocorticotropic hormone) that triggers our adrenal glands to release adrenalin and the primary stress hormone, cortisol. Adrenalin increases heart rate, blood pressure and energy supplies; cortisol increases glucose in the blood stream and has many beneficial effects on the immune system and brain, among other organs. Cortisol gets a bad rap yet in “fight-flight” situations, cortisol moderates immune-system responses, suppresses the digestive system, while at the same time communicating with brain regions that control cognitive function, mood, motivation and fear. Biochemical mediators such as cortisol and adrenalin help us adapt as long as they are turned on in a balanced way when we need them, and then turned off again when the challenge is over. When that does not happen, these ‘hormones of stress’ can cause unhealthy changes in the brain and body, i.e., high or low blood pressure, accumulation of belly fat, etc. When wear and tear on the body results from imbalance of the chemical mediators, we use the term allostatic load, and when wear and tear reaches higher levels, we call it allostatic overload … and this is what occurs in toxic stress. One of the side effects of living in a digitally driven world is that our biology is often short-circuited, causing us to be increasingly removed from our innate physicality. As the balance of neurochemicals that have evolved for millennia become disrupted by today’s modern lives, our clients become more prone to depression, anxiety, and pain. So let’s discuss four brain molecules linked to happiness and offer simple ways manual therapists can help trigger their release and, in the process, create better communication skills to enhance pain neuroscience education. The acronym DOSE (Dopamine, Oxytocin, Serotonin, and Endorphins) is used to describe the hormonal quartet responsible for those feel-good feelings, and although there are many ways to stimulate their secretion, we’ll focus on the ones we can get our hands on. Secreted by the hypothalamus in anticipationof rewards, dopamine is a chemical messenger called a neurotransmitter. It drives our brain’s reward system and stimulates pleasure-seeking behavior, motivating us to take action toward goals, desires, and needs… and giving us a surge of reinforcing pleasure as we achieve them. Clients love to set and achieve therapeutic goals, from freer movement and posture improvement to enhanced performance and less pain, and we can use our understanding of dopamine to help them get what they want. For starters, break big bodywork goals down into smaller ones, so the client’s brain can celebrate with a hit of dopamine each time it anticipates reaching the finish line. To avoid a dopamine hangover, continue to stimulate the release of this happiness hormone by helping the client set a new goal prior to achieving the current one. 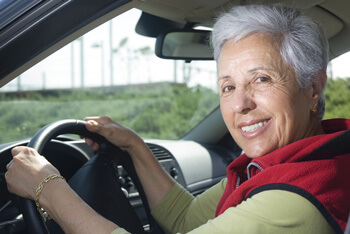 For example, if a client comes to you complaining of a chronic neck crick that’s affecting her sleep and impairing her driving due to lack of head rotation, ask her to make note of how much better her neck feels on the drive home. Just the anticipation of moving better will enhance dopamine production and, in turn, the hands-on work. To keep the feel-good chemicals flowing, instruct her to perform a simple homework exercise, such as staring in the mirror while rotating her shoulders side-to-side. This novel maneuver tricks the brain into believing it can rotate the head without threat. By completing the exercise each night, she will begin to rest more comfortably. To stimulate dopamine at the next session, praise her efforts and encourage her toward achieving her next goal. The pleasure-reward hormone will give her a lift before the hands-on work even begins. Other studies have concluded that non-vigorous massage with the intent of pampering the client better enhances oxytocin release.2 For best results, I suggest experimenting with various levels of hand pressure during sessions. 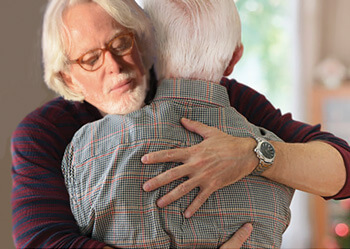 If the situation permits, give the client a post-therapy hug to stimulate their social chemicals. You’ll find it will provide you both with a feel-good oxytocin buzz. Serotonin, another mood-boosting neurotransmitter, was made famous by the invention of SSRI (selective serotonin reuptake inhibitor) antidepressants, which increase the brain’s serotonin levels. 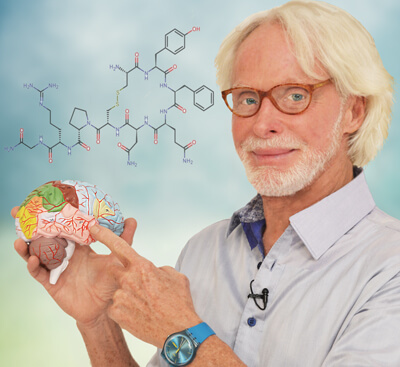 This neurotransmitter directly influences dopamine — the chemical that makes your client feel good — so it’s important to know how to trigger it. The most effective and natural way to boost serotonin is through exercise, biosocial bonding, and good bodywork. Don’t be surprised when the client falls asleep on the therapy table even when receiving vigorous soft-tissue manipulation, as the production of serotonin is a key component of sleep. Along with your hands-on work, an additional way to get serotonin flowing is by assuring the client they are being heard and respected. It’s important to stay present and engaged from the time they walk in the door. Reflecting on past therapeutic achievements also elevates their mood as they re-live the experience and take pride in the goals they have achieved. Endorphins are released by the brain, spinal cord, and pituitary gland in response to stressful situations, perceived threat, or pain. They temporarily buffer pain in much the same way as drugs such as morphine and codeine and are known to bring on feelings of euphoria (runner’s high) during vigorous exercise. Working in conjunction with serotonin, endorphins also help alleviate anxiety and depression. Researchers have found slow, sustained deep-tissue work best stimulates the release of endorphins, causing the brain to gate the pain. In the beginning, endorphin work only masks the client’s discomfort, but with each session, the brain begins changing its mind about the pain as confidence in the therapeutic intervention increases. 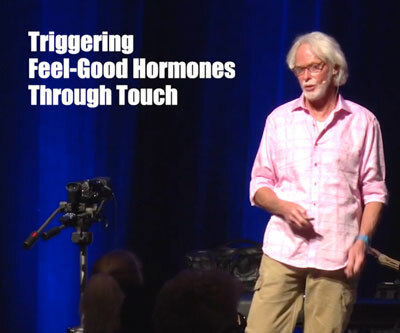 Our bodies are home to an intricate hormonal system that constantly works for our survival. This system produces feel-good chemicals as the motivation and reward for taking steps toward what’s good for us. Together, these hormones create a desirable brain state that keeps people coming back for more. Since the therapeutic goal of bodywork is to tilt the balance away from stress and toward relaxation and healing, we can use our hands-on work to help give a boost to these essential happiness hormones while enhancing pain neuroscience client education. Vigotsky, A., & Bruhns, R. (2015) The role of descending modulation in manual therapy and its analgesic implications: a narrative review. Pain Research and Treatment.